IMPORTANT - Restrictions on use You must pay £1 per pilot to the farmer at Hill Top Farm if you intend to land in one of the four nominated fields (See Map below) This is the white farmhouse you can see from the landing fields = on the other side of the road. Please arrange which landing field to use BEFORE you go flying and only use agreed fields. A large impressive site which is good in light wind or thermic conditions. 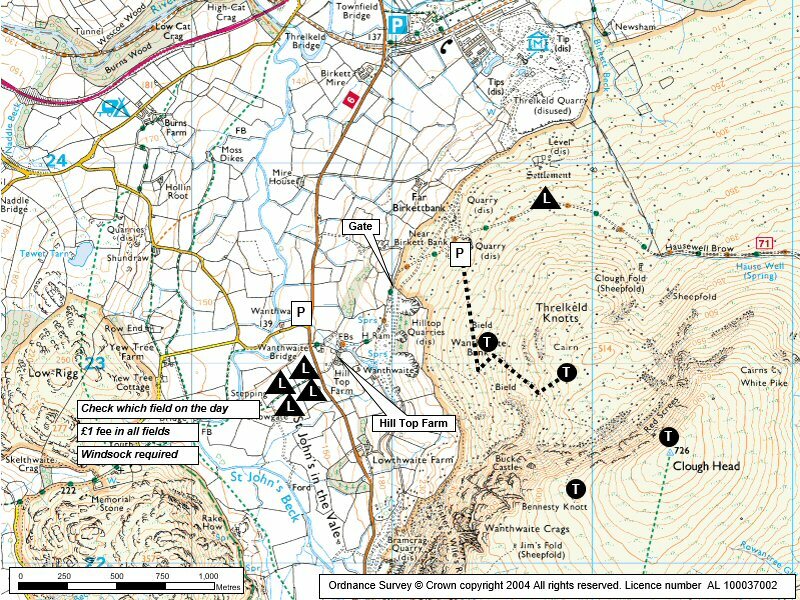 The site gives easy access to the chain of high ridges running south towards Helvellyn. From Penrith or Keswick, take the A66(T) and turn off onto the B5322 at Threlkeld. If travelling from the Ambleside / Grasmere direction take the A591 north and turn off onto the B5322 at St. John's in the Vale. The access track to the fellside begins at grid reference NY 316 231 (signposted 'Old Coach Road'). There is limited parking at the start of the track - do not block. The usual practice is to drive up the track passing through two gates (shut after use) to the open fell. The car parking area is 80m / 250' higher in a flat quarry (hidden from view)on the right of the steep and loose track (maintained by the Allerdale Council). The track is in poor condition so the alternative is to park on the main road and walk up. 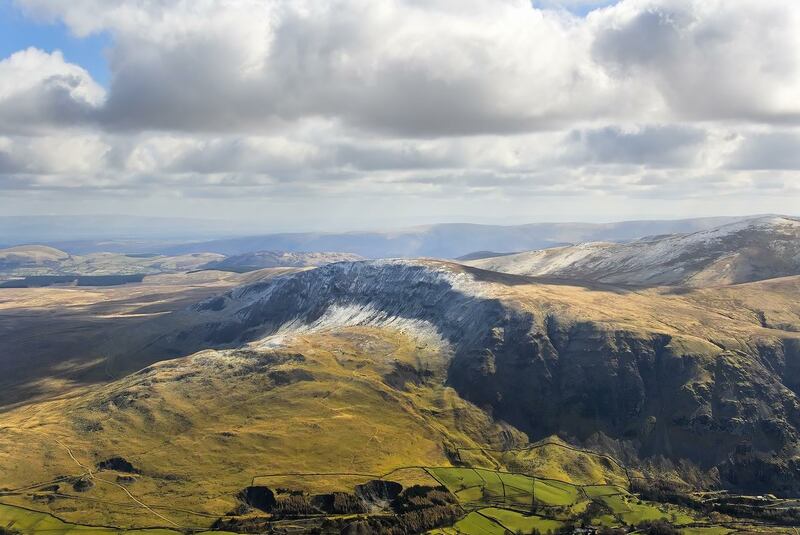 Make for a suitable take off area on Threlkeld Knots that rise above the quarry to the SE. The path is vague to start with but you will soon find a more definite track that can be followed to the take off area. In light wind / nil wind conditions it may be necessary to go right to the summit of Clough Head itself. This is a stiff 1180'/360m of ascent from the quarry. Hill Top Farm main access and three other local farms. Consider the wind speed due to compression over the shallow summit slopes. Keep well forward and crab north if getting blown back. Pilots should be reasonably experienced to cope with certain conditions found at and around the site, especially during the spring months. Beware of scratching too close to the cliffs in thermic conditions or if the wind has a little south in it. St John's in the Vale valley has a lot of RAF activity, so it is advised to CANP this site before flying. The take off area is grassy and covers a large area. Its a matter of picking the best area given the previaling wind direction. Recommended practise is to make a few beats in the Threkeld Knotts area before making for the Wanthwaite Crags area. The scoop to the south of take off can be a bit sinky so its best to get a bit of height before making the traverse. You can usually get good lift over Wanthwaite but be aware that this area is pretty unforgiving. If the wind is south of west you may need to be careful here. You must pay 1 pound per pilot to the farmer at Hill Top Farm if you intend to land in one of the four nominated fields (See Map below) This is the white farmhouse you can see from the landing fields = on the other side of the road. Pilots must arrange which landing field to use BEFORE going flying and only use agreed field(s). Occasionally the fields are unavailable due to stock or crop. Please respect the farmer's request and land on the fell side instead. A windsock is very useful in the bottom landing field - not least to show other pilots the correct field for the day. It can be lifty over the landing fields: prepare to be patient - the fields are separated by dry stone walls which are very unforgiving. Care when top & especially side landing due to hidden rocks. 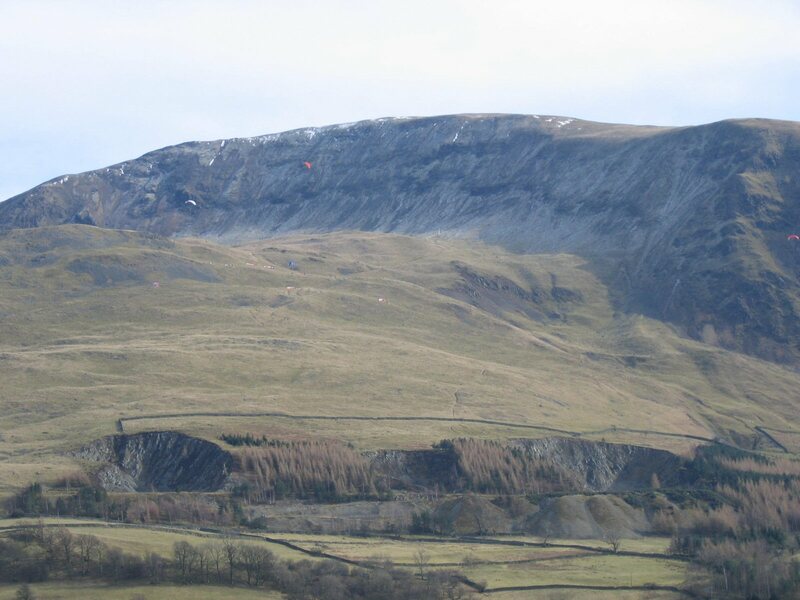 In fresh winds there can be a significant venturi effect to the north of Threlkeld Knotts, so if landing here be ready to keep forward. The site gives excellent XC potential with routes to the south along the Helvellyn Range and on towards Ambleside and Kendal and routes over the high fells heading south east towards the Howgills and the Yorkshire Dales. In nil wind or light wind conditions the site offers the potential for some great triangle flights. The site is often considered an 'afternoon site' after the sun has warmed up the cliffs. Although the sea breeze can occasionally reach Clough Head, it doesn't present any particular hazard, but (as usual) kills the thermals. 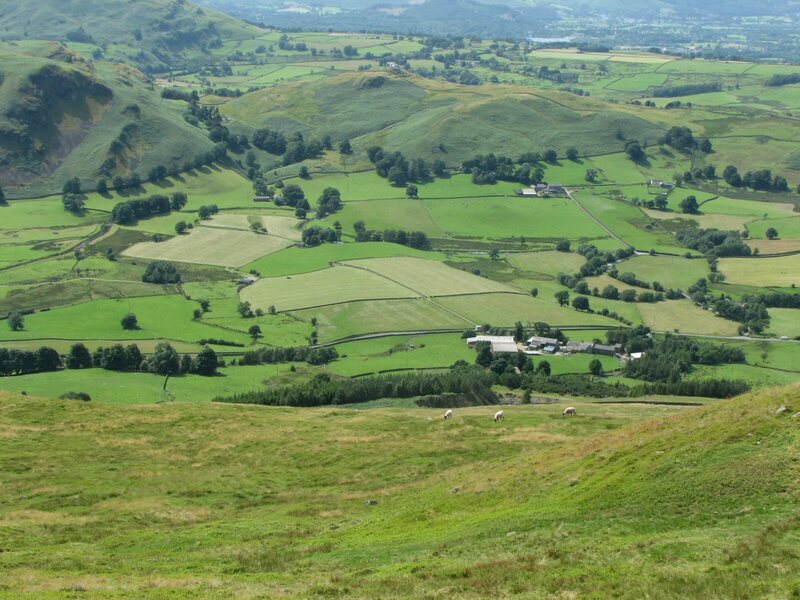 Avoid any ground skimming over the lower slopes especially during the lambing period (Feb - May). 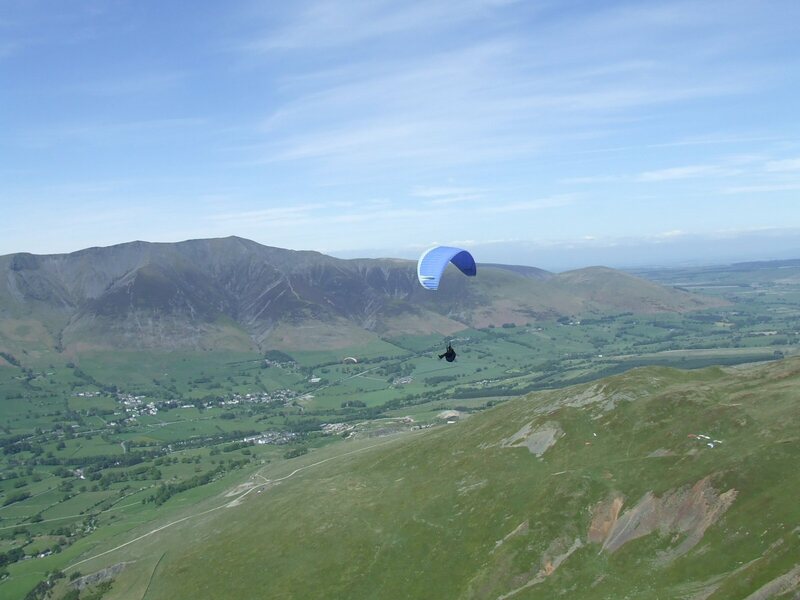 Clough Head is a valued hang gliding site which poses few problems but there are limited landing opportunities between Helvellyn and Seat Sandal (forest and water). Do not get too low. The site gives excellent XC potential with routes to the south along the Helvellyn Range and on towards Ambleside and Kendal and routes over the high fells heading south east towards the Howgills and the Yorkshire Dales. In nil wind or light wind conditions the site offers the potential for some great triangle flights. An aerial view of Clough Head looking SE. The car parking quarry can be seen in the lower left of the picture with the track to take off leading diagonally right up the fell side. Take off is generally in the area around the track just before the snow line. Photo reproduced with the permission of the copyright owner, Andrew McMahon. More pictures can be found on his web site. Looking down on the site from a glider. Takeoff is at the bottom of the picture; the car park quarry is over on the right and the landing area to the right of the car park. 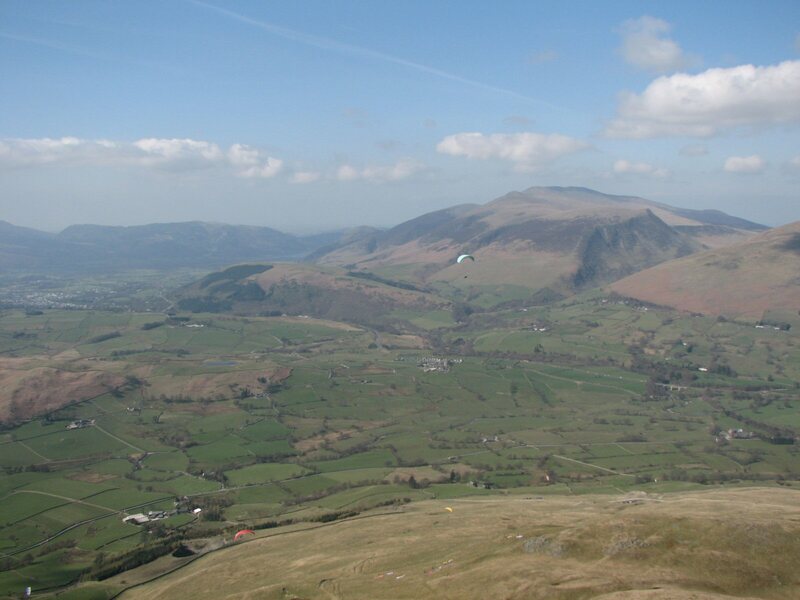 The alternative to landing on the fell are the 4 fiields in the valley in the centre of the photo as the quadrants of a cross. This photo was taken in July when the grass was being cut. Notes : Landed Aberford - between Leeds and Selby - 152.2km via 3 turn-points. Click here for more details. Notes : Ed Cleasby provided the much needed retrieve! Google Earth - Sample Flight 2 Ridge running for beginners. Ian Henderson's first trip down the ridge to Grasmere. It was the thermal over the quarry that finally gave me the confidence to go. Google Street View - Parking The beginning of the track up to Clough Head. The track is deteriorating, only go past the gateif you have a 4x4 or you don't care about your car. Please be considerate when parking your car and allow room for people in the bungalow.